Quite Possibly My Best Muffin Recipe Yet! I love hummingbird cake. If you’ve never had one, you must try it. I have it every year on my birthday, always from Gabriel’s Desserts. I think it is a Southern thing as I haven’t met anyone outside the South that is familiar with it. 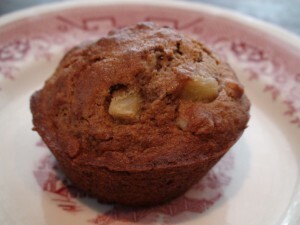 But think carrot cake without the carrots and banana and pineapple in its place – yet such a subtle flavor of both. And of course then there is the cream cheese icing. But I digress. Last night I was looking at all of the frozen overripe bananas in my freezer and decided I really needed to start baking. Then it hit me, why not make hummingbird muffins! So that is what I set out to do this afternoon with my intern, Mackie. And I must say, I think my first shot at it was pretty near perfection (at least to my taste buds). Can you tell I’m working on my food photography skills? Unfortunately it clouded up right when I was taking the shot, so the lighting isn’t the best. Preheat oven to 350 degrees F. Grease muffin pan. Add flour, flaxseed, baking soda, salt and cinnamon to a large mixing bowl. Stir well to combine. Put brown sugar, eggs, vanilla, canola oil and applesauce in a medium mixing bowl. Whisk until well-blended. Stir in banana and pineapple. Add wet ingredients to dry ingredients and stir just until moistened. Stir in walnuts. Fill each muffin cup about 2/3 full. Bake until starting to brown and toothpick inserted in middle comes out clean, about 18-20 minutes. Let muffins cool in pan for a few minutes then carefully remove and cool on a wire rack. I can’t wait for my son to get up from his nap to try one. Enjoy!